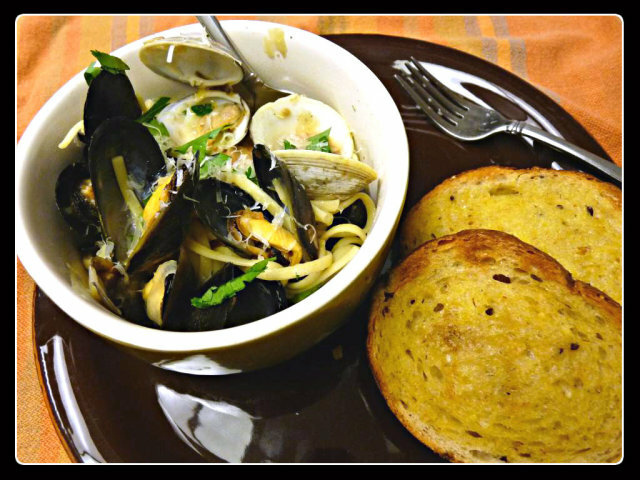 Mussels are one of our favorites. 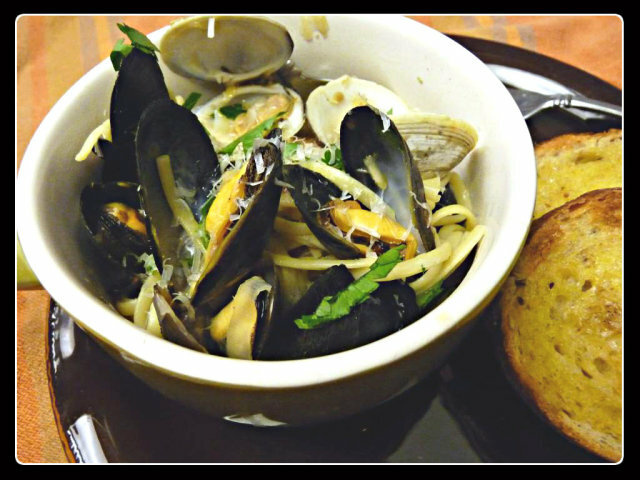 Nothing like a steaming bowl of mussels swimming around in hot broth with a hunk of hot, crusty bread ready to sop up all that goodness. I must admit, I’d never had mussels before Mrs. G and I started dating. But once I did, I was hooked. These days, Grandma isn’t doing too well. We went to visit her this weekend, to catch up and had a grand ole time. She was telling stories and we talked about food. Did we ever talk about food! She knows all kinds of tricks I’d never heard of. 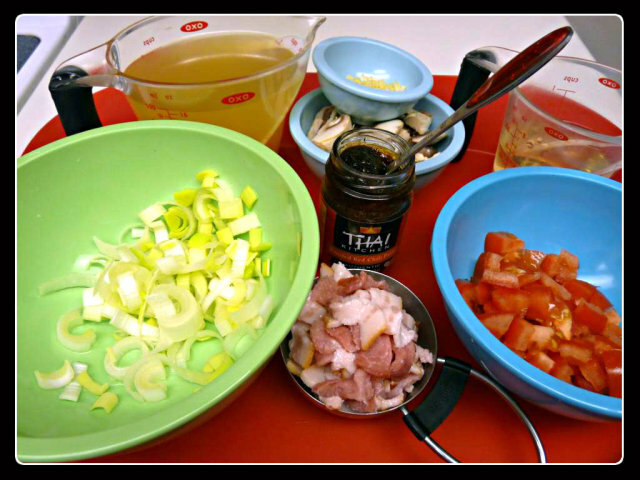 (Did you know that adding vinegar to pie crusts makes it tender and flaky? I didn’t, but then I’ve never made a pie crust.) Anyways, I digress. One of the things she wanted me to do was to look through her cookbooks and take any that I wanted. One that I took was “Blue Bonnet Cafe: Still Cookin’ 80th Anniversary Cookbook”. Looking through it, I spotted a recipe for Spicy Mussels and knew that this would be one of the first things I would try. 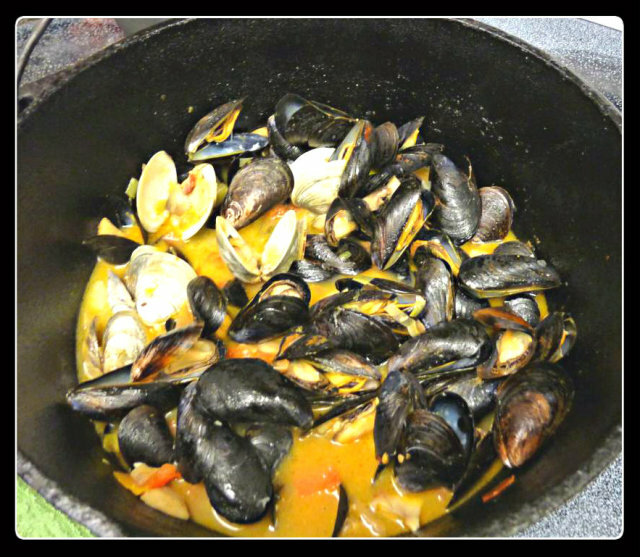 And even though Grandma would probably never cook mussels (let alone this recipe) as I was cooking it, I couldn’t help but think of her, the food she so lovingly prepared for us and the times we shared and I couldn’t help but smile. I know she’s going to read this. Thank you for everything Grandma and I love you. Cook bacon in a dutch oven at moderately high heat (350F on the Big Green Egg directly on the grate) until the fat is beginning to crisp. 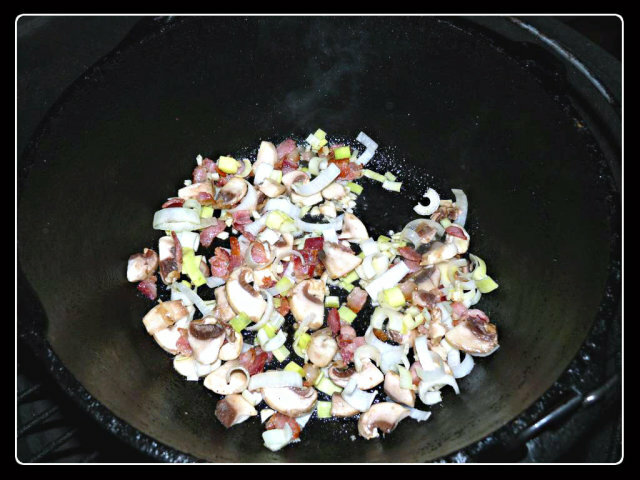 Add leaks, mushrooms and garlic and cook until just tender. 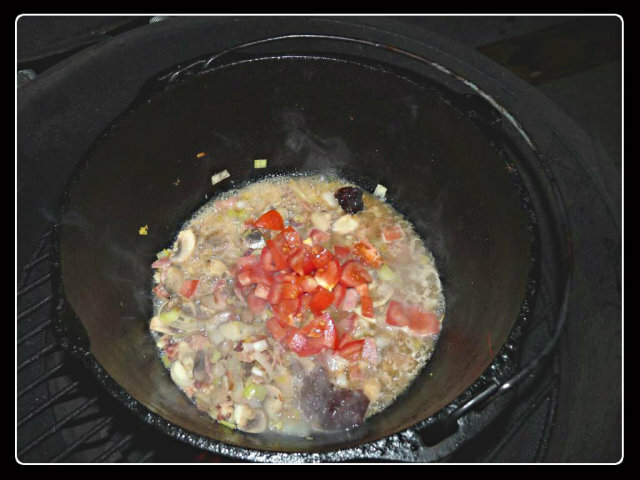 Deglaze the dutch oven with the white wine and then add the tomatoes, chicken broth and red curry paste, stirring well to incorporate the ingredients. Add the clams (discarding any that are open or cracked). If cooking on a stove, cover the pot. 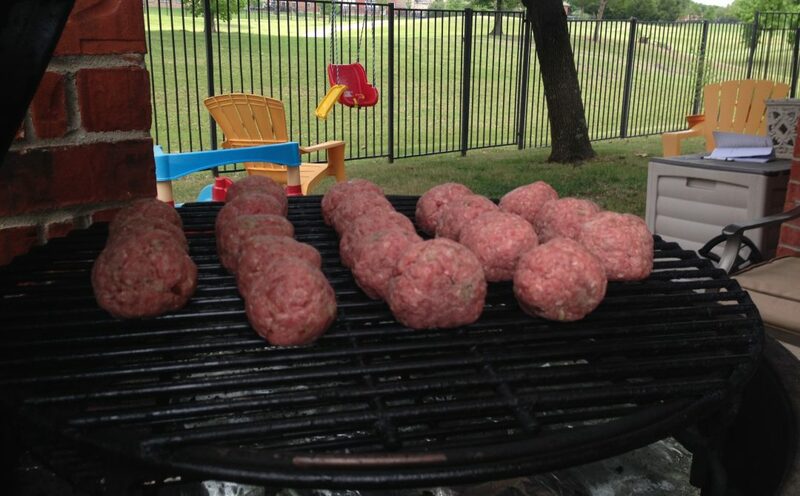 If using a BGE, close the lid. 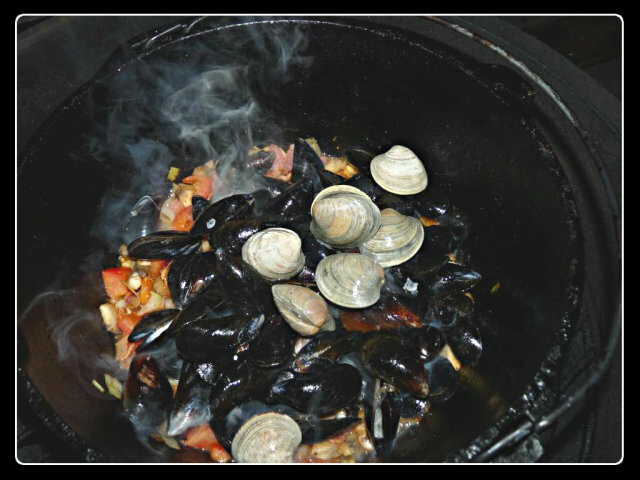 Stir occasionally (every 3 -4 minutes) and continue cooking until all the mussels and clams have opened, about 10 to 12 minutes. Turn off heat (or remove from BGE) and add butter and salt and pepper to taste. Serve with hot crusty bread to dunk in the broth. Maybe served over linguini, as seen here, if desired. 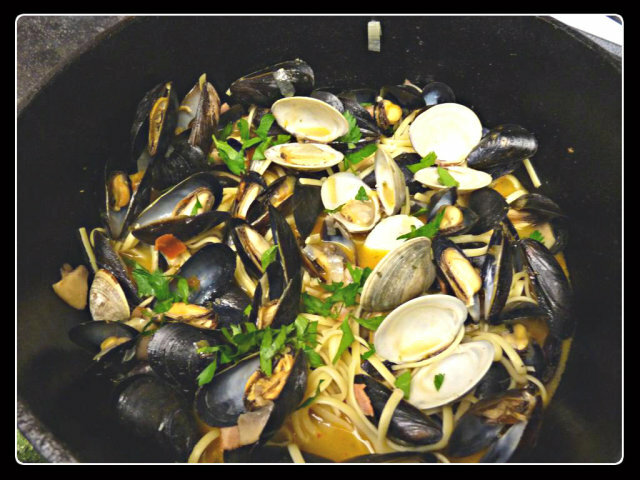 We love mussels and clams. Very nice, indeed! Thank you. It was. 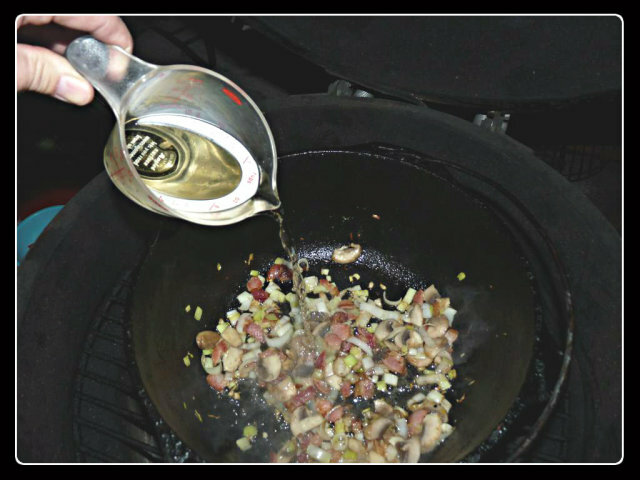 And so easy to do, whether on a grill or inside on a stove. Give it a shot. I’m not a big fan of mussels or most bivalves. I used to love oysters but even that has faded. But I am sure Alexis would like this. Really? I’m not sure we can be friends then. 😉 I told Mrs. G to check out your site the other day. She was really impressed. Especially with your pictures. She wants to know you secret.